It was in 1968, during times of tremendous social and economic struggle, that Hermann Gmeiner's idea made its way to Honduras. Since then, the work of SOS Children's Villages has continued in the nation's capital Tegucigalpa and beyond. At present there are in Honduras seven SOS Children's Villages, five SOS Youth Facilities, one SOS Vocational Training Centre, six SOS Social Centres and one SOS Medical Centre. The Republic of Honduras is situated in Central America. It shares borders with Nicaragua to the south, El Salvador to the south-west and Guatemala to the north-west. The Spanish term "Honduras" translates into "Depths". Allegedly, Columbus gave the country its name, because of the deep waters off the Northern coast. Honduras has a total population of around 9 million people of which roughly 1.2 million live in Tegucigalpa, the country's capital. Formerly Honduras used to be known as "Spanish Honduras" in order to distinguish it from neighbouring "British Honduras", present-day Belize. The country's official language is Spanish, which is spoken by nearly all Hondurans. Nonetheless, indigenous minorities such as the Miskitos, who inhabit the south-eastern section of the country, have managed to preserve their native languages over time. Honduras has subtropical climate which varies according to altitude inland. Honduras is characterised by a rapidly growing and noticeably young population: at present, nearly 40 per cent of all Hondurans are under the age of 15. More than half the people live below the national poverty line; approximately 43 per cent of them suffer conditions of extreme poverty. Malnutrition, poor housing infrastructure and infant diseases are widespread and serious problems. Bad infrastructure is especially manifest in rural areas. Around 80 per cent of all Hondurans living in such areas do not have access to clean water and sanitation. Illiteracy rates have reached worryingly high levels: one in six Hondurans over the age of 15 cannot read and write. In 1998, Hurricane "Mitch" hit Honduras harder than any other country in the region. Nearly 15,000 people lost their lives in what is considered one of the most devastating natural disasters in the country's history, causing an estimated USD 3.8 billion of damage. Honduras has been characterised by large-scale economic and political migration, especially in the period between 2001 and 2007. Thousands of Hondurans have left their home country in search of a better life. Most of them have gone to the United States where they re-unite with family members and friends. The money they send home, the so-called "remesa", now represents a significant source of income to many Honduran families. Another major problem in Honduras is the phenomenon of gang violence. 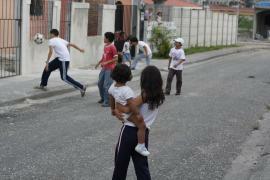 The "maras", violent streets gangs, often take over entire streets and barrios. They specifically attract minors, who are predominantly recruited in poor neighbourhoods where young adults have nothing to lose. The infamously vicious "Mara Salvatrucha" now has nearly 100,000 members, many of them young children. The government of Honduras ratified the UN Convention on the Rights of the Child in 1990. Nonetheless, many children in the country face great hardship: 1 out of 10 children aged 1-5 is chronically undernourished and nearly a third of all Honduran children below the age of five suffer from stunting. Social exclusion, poverty and a lack of family support often drive minors into criminal activities. Approximately 150,000 children in the country are orphans as a result of political and economic instability. Maras (gangs) often serve as a substitute family to children whose families have either fallen apart or have failed to provide love, respect and positive adult role models. Child labour has also become a serious problem in this Central American country. According to the International Labour Organisation (ILO), around 10 per cent of all children between the ages of 5 and 14 are involved in child labour activities. Most of these children do not attend school and consequently do not receive basic education. An even bigger problem is the growing number of children who experience sexual exploitation. In the streets of Tegucigalpa, the country's capital, and in the city of Comayagüela, about 2,400 children are forced into prostitution. Although girls are especially at risk, the number of boys who experience sexual exploitation is on the rise. 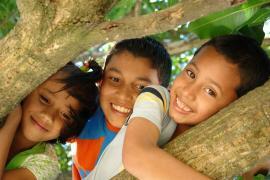 SOS Children's Villages started its activities in Honduras in the year 1968. In 1970, we started working in Tegucigalpa, the country's capital. When Hurricane Mitch devastated vast parts of Honduras, SOS Children's Villages intensified its work in Honduras by starting a wide-reaching emergency relief programme in order to alleviate the people's suffering. At present, we are supporting children and young people via seven SOS Children's Villages in Honduras: Tela, La Ceiba, San Pedro Sula, Santa Rosa de Copán, Valle de Ángeles, Choluteca and Tegucigalpa. We are providing them with day-care, education, medical services and vocational training. Children whose parents cannot take care of them will find a loving home in one of the SOS families.